7.52 points at 21 votes (rank 193). Gamebase64 8 1998 - "Good"
Mechanicus is a pinball for up to 4 players. It is interesting because it has three different tables (levels), which can also be chosen in the main menu, as well as a lot of extras. Each player has three balls at the start of the game. Extra balls are given at 30.000, 80.000, 130.000 and 180.000 points. After each last ball a "special ball" gets into the game. The time of this ball depends on the timer value at the lower right. If a special ball gets lost, this costs 3 minutes of the timer value. 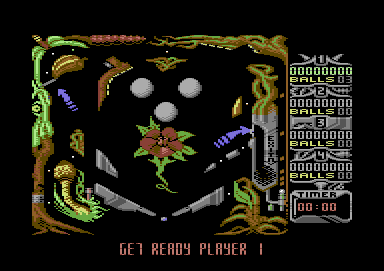 If the ball is stopped by the flipper the player gets a status report shown in the status bar as a general overview. 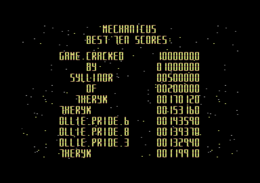 When reaching 100.000 points, an exit opens and the next level is entered when the ball goes there. In the multiplayer mode the exit is instantly open for all players, as soon as one of the players has reached the necessary score. Independent of who hits the exit first, also all other players are transported into the next level. 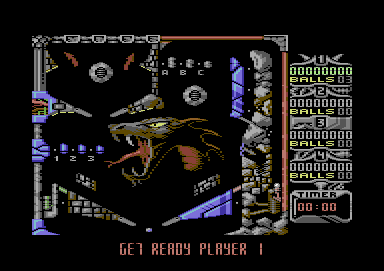 The game has a graphically very filed and multicoloured 2D design of the 3 single screen pinball tables, a very good, rocky introduction music and great sound effects. F1 - F7 = The ball is shot into the field (with different momentum) (F1-slow, F7-very fast). Shift l/r = The flippers (left/right) are moved. Space = Bump against the table so that the pinball gets "jolted", sometimes the only possibility to save the ball. You best use it together with the Shift keys but not so hard that "TILT!" appears, because then the flippers will be blocked and the ball is bust. Restore = Back to the main menu (abort). 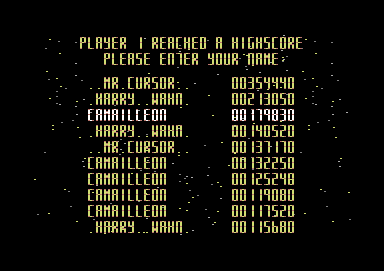 If you have reached a high enough score you can enter your name into the highscore list which is automatically saved on disk. and to confirm press the key Return . 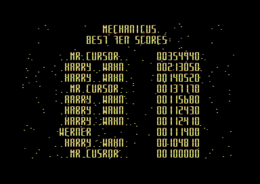 To see the highscore list, press the key H in the main menu. Current score and balls left for player 1 to player 4. Play time display for the special ball (timer). At the lower border of the screen is a status line where the current messages are shown by the programme. If you let the ball rest on one of the flippers you will get a "Status Report", which shows, how many points are needed for the next extra ball and for unlocking the next level. Activate the extra shield instantly after the start: Later in the game you seldom have as much control over the ball as when you shoot it, so you should play on this. For this you simply keep in mind at which position of the swinging pointer the ball will activate the "Extra Shield" instantly after firing, e.g. by pressing F7 shortly before the points is at the utter left. With this you have deactivated a for pinballs typical trap (actually the meanest position in this level) for a certain time. As the Shift keys are needed there may be need to deactivate the auto repeat and auto lock function of the keyboard, depending on the hardware and operating system, to be able to play properly, e.g. in Win 7. You have to reach a certain score to end a level. You get the first extra ball at 30.000 points. The timer counts upwards 5 seconds (or 10 seconds without activated Extra Shield), if you collect one of the dots or hit a bumper. This decides about how many bonus points you get after losing the ball. The sum of the first 3 balls then determines for how long you are allowed to play the last ball. As soon as the time has run out, you cannot move the flippers any more. When losing the last ball before the time has run out and there are over 3 minutes left, 3 minutes are subtracted and you can play another ball for the rest of the time. Extra Shield and Ball Stopper are only active for a limited durance. If you have hit them a few times with the ball, they will disappear and you need to renew them. Sledgie: "I like the music and the poppy design much in this pinball. However, the ball could be a bit bigger." Guybrush: "This is second-in line after the time-honoured David's Midnight Magic of the most culty pinballs on the C64, the sound was doozy, I liked to play this game and played it often, so I like to give 9 points." Doc Phura: "When I read the name in the games list I instantly had the skull present. Must have impressed me much concerning the graphics at that time. In any case I have played it much and long - but without getting really good. 9 points from me." 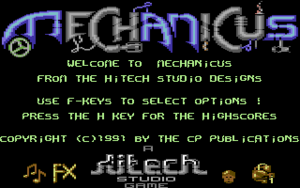 TheRyk: "Until I discovered Mechanicus, I had always thought, flippers for C64 were rather poor, sorry, fans of Midnight Magic and Night Mission. Mechanicus could have some more action and be a little easier. But it's a very good game with excellent music. 7 points." Shmendric: Remembering the GameOn... 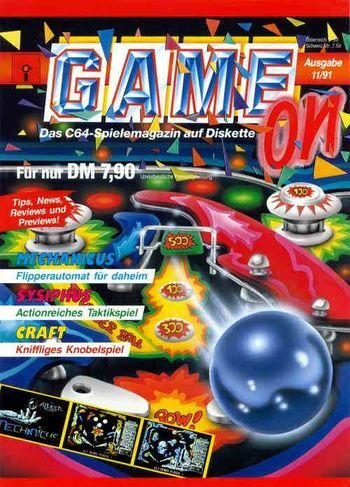 I had a subscription at that time, this issue was also amongst them. I never really embraced this pinball, but I am also not generally a fan of this genre. As far as I remember, the sound was rather zippy though. Bug: If you change to the next level all points (which is over 100.000 points) are deleted. This page was last modified on 19 June 2017, at 06:06.